Ryan: Kyley did a video a long time ago discussing how a chisel ground knife is really not any thinner than a conventionally ground knife. His reasons were sound, but I do have some issues accepting it. All of the true chisel ground knives I have used (CMFTW Ti knife and the Kershaw/Emerson) do seem to bite into materials better than similarly ground knives. I full expect to get into it with Cliff over this, I don't know. Might be a lot of preconceived bias. Edited 1 time(s). Last edit at 07/30/2016 04:44PM by Bugout Bill. Well I wasn't talking about the edge thickness, but rather the edge angle. The bevel on the Kershaw you sent me was, IIRC, around 20-25 degrees included because of the chisel grind. The edge thickness wasn't anything extraordinary, but the edge angle was lower than a lot of the knives I've seen out of the box. Ryan: I think that was also Kyley's point. The edge angle is still the same as another knife. I think, maybe he will chime in. Alright. It's a bit hard to tell now that I did that spazzy regrind but I could hit the original bevel with the sharpmaker 20 degree slot if I very slightly tilted the knife away from the rod. And the flat side of the blade appears to be vertical, or zero degrees in relation to the other side of the blade. Do you have a way to measure the angle on the one I sent you? Ryan: I do not, unfortunately. No worries man, I was just curious. I have to correct myself here. I just checked the bevel on the reground Kershaw/Emerson and the bevel I created is matching the 20 degree setting of the sharpmaker nearly perfectly. That bevel is significantly wider than the stock one, so I definitely misremembered the original configuration. The edge angle has been lowered quite a bit so I would imagine that the edge angle originally was close to the common 20-25 degrees per side, as opposed to the 10 degrees per side it's currently at. My mistake fellas. I was wondering where to leave this question but I guess I will leave it here. My birthday is coming up and I decided I would treat myself to a folder. I am sad to say I am mostly looking at Kershaw knives, which perhaps aren't the best knife company but have a lot of designs I like. I am indecised between the Link (420HC steel is the largest draw to me), the Induction (G&G Hawk designed knife, neat little locking mechanism) and one of the Emerson colabborations (I was thinking the 4K - I'm looking for something with a decent grind height and not chisel ground) because I want to try the Wave feature out. Recommendations/ thoughts? I know there are a lot of talks like these in other forums but I respect the opinion of people here a lot more than in your average knife forum, so I felt I should ask. Those sound like good choices...hard to pick just one! With the Kershaws, just be aware that they have somewhat variable build quality. If you care about warranty claims, it might be better to try and find a Spyderco Waved Delica for a reasonable price. 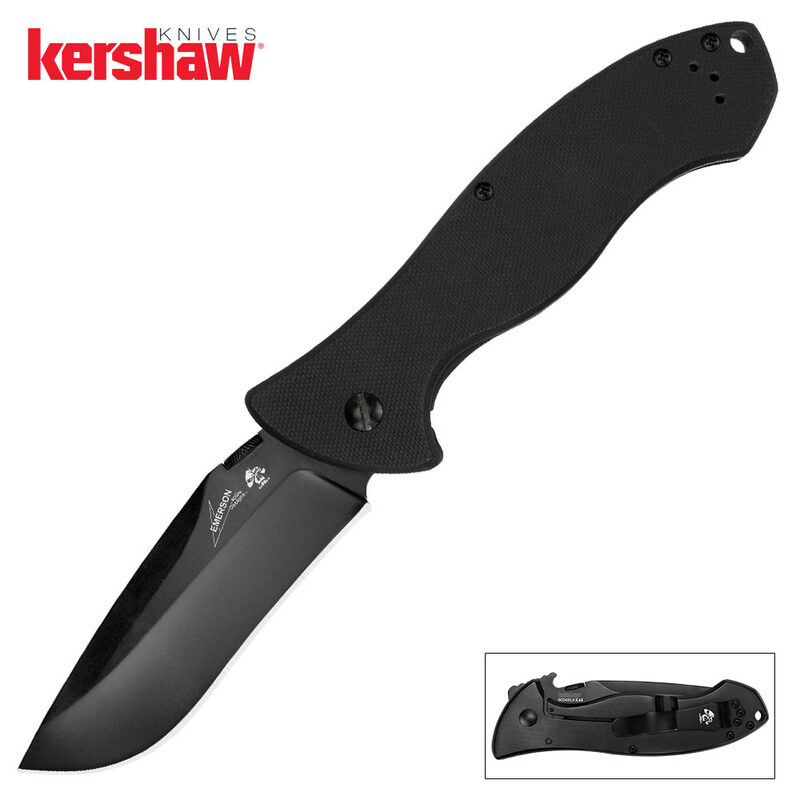 That being said, I would personally look into the Kershaw CQC-4KXL. The larger size leads to slightly nicer ergos. Huh. You know, I was looking at the related searches onn eBay and actually the Kershaw CQC 9K looks pretty good. And the Induction is still on pre-order, so I'll wait until more reviews are out on that. The Link... because of shipping, seems more expensive than I want, despite the fact I dig the design. Thanks for the help! Hi Bill. Yes, I did an extensive video, and the simple reality is that anything you percieve as better cutting from a chisel vs a non chisel is geometry related and nothing else. Feelings aside. Take the following example, which has a v-grind, and a chisel grind which are identically equal. one can't be better than the other implicitly.. Why? because its the same triangle that I rotated with an image editor. a 25Degree inclusive chisel is the same as a 25 degree v grind. the confusion arises when you have a 15DPS v grind and people take a 15degree inclusive chisel as the "equivalent" and say its twice as lean.. this is just fundamentally flawed math as a 15degree inclusive chisel is a 7.5dps v turned on its side. I've also had a similar long debate with a friend knifemaker a long time ago, because when I was saying a full flat zero V-grind of 6dps to a spine thickness of 6mm, in his mind a chisel grind of the same knife was a 3dps knife with a 3mm spine (chop it in 1/2) so its leaner and better. its not apples with apples any more. Now.. putting that aside.. of course there will be noticable differences in cutting performance in different media because most knives are not triangles, but facets at a minimum on most production a primary and secondary of significant difference in angle with a edge bevel. the assymetric entry into the cutting material is going to create difference deflections of resistance etc as a chisel will want to push all things to one side and the v-grind wants to spread it evenly.. so if you are shaving slices off the end of a hard tuber a chisel is deflecting everything off the side with least mass, making it feel easier.. a v would resist more pushing 1/2 the energy into the primary mass of the cut material..
if the knives are ground keenly enough, the differences are negligible. here are the videos. Like anything I do. its not pre-scripted, and I'm speaking in laymen terms.. hence.. verify.. peer review.. dont take anything I say as gospel without testing. Kyley: Thanks a bunch. That makes sense.